MERCATOR - Africa ex magna orbis terre descriptione Gerardi Mercator. . .
MERCATOR, G. / HONDIUS, J. - Africa ex magna orbis terre descriptione Gerardi Mercator. . .
Africa ex magna orbis terre descriptione Gerardi Mercator. . . - MERCATOR, G. / HONDIUS, J. 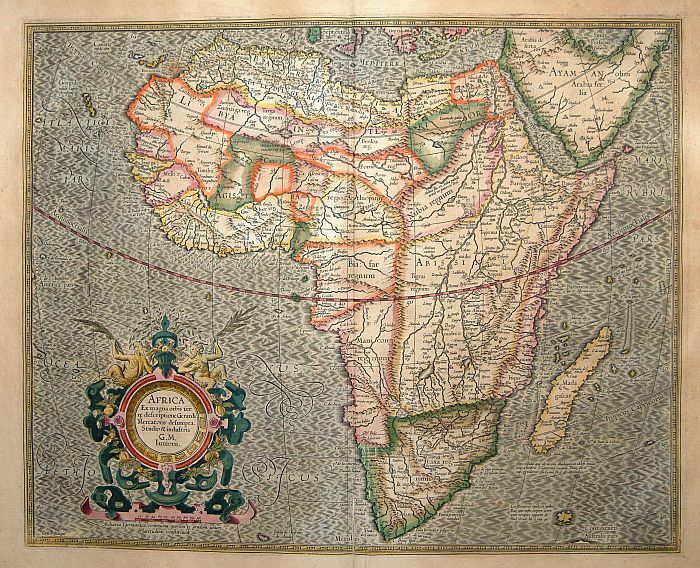 Title : Africa ex magna orbis terre descriptione Gerardi Mercator. . .. Size : 14.9 x 18.5 inches. / 37.8 x 47.1 cm. Description :Map of Africa. Much of the interior of Africa defers to the traditions of Ptolemy. The Nile river is shown with the two lakes and the Mountains of the Moon across southern Africa. Mercator shows Portuguese exploration up the Cuama (Zambezi) River into the interior of south central Africa in the region of Monomotapa or Benamataxa, as he named it on his map. Ca. Portogal (the Portuguese Fort) is placed on the map within the junction of the Spirito and Cuama rivers. The cartouche is circular, surrounded by decorative scrolls and surmounted by two satyrs. The beautiful calligraphy is a special feature of Mercator maps. The projection associated with Mercator was not used in this particular map. Basically, much the same information is supplied in this map. Norwich's map of Africa, Map21. Condition : A good and strong impression. Paper slightly age-toned, as usual. Repair to lower part center fold. Altogether in very good condition.